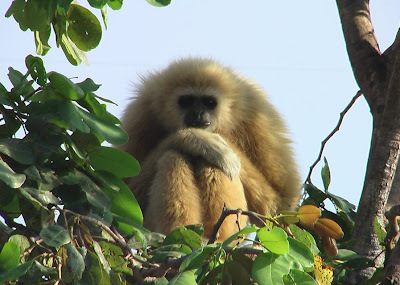 Mark Oftedal: "Gibbons, Calling For Home"
The first time I saw a wild gibbon I was hiking in Khao Sam Roi Yot, a national park in the south of Thailand. I was resting on a wide limestone cliff, taking in a the view of the Gulf of Thailand sparkling behind a thin row of trees. The leaves rustled and two animals, a mother and baby monkey I guessed, swung past. A moment later a larger individual emerged and paused in my line of sight. Otherwise all black, white fur framed its dark face. I looked up into its eyes, it looked down into mine. It leaped away with long arms gracefully reaching from branch to branch, and the others followed. These creatures were primates, but not monkeys. They were gibbons. At any rate, the moment did make a lasting impression. A couple of years later I visited the Wildlife Friends of Thailand in Petchaburi province, a 2 hour drive outside of Bangkok. The center hosts a large number of rescued animals including monkeys, elephants, civet cats, bears, a tiger, and a whole lot of gibbons. So here it is a couple years later, and I just finished the artwork for Edwin’s story about the life of a gibbon named Henry. 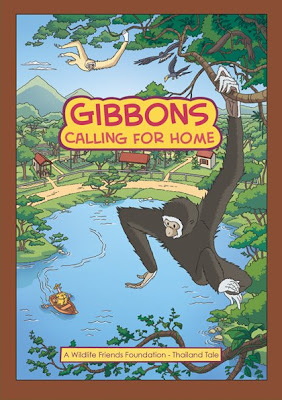 It’s called "Gibbons, Calling For Home", and will be printed in the coming weeks. The bulk of those copies will be printed in Thai language and sent out to the local schools to help raise awareness, and we'll also print a number of copies in English for tourists and expats. 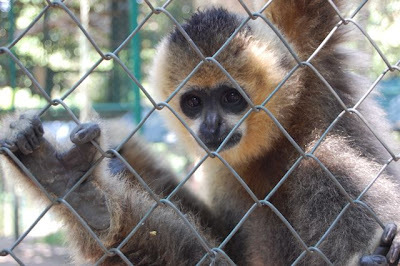 Later this year Edwin’s center will release a captive gibbon back into the wild, which is a huge achievement! The gibbons in our story have a similar happy ending, but our main character goes through much suffering along the way. To add a little humor I drew the naturally funny Edwin into the story as the narrator. Apologies to Edwin, who is not pear-shaped in real life...he just looked funnier that way. I’ll post again with more pictures as we get closer to the print date. The printing is to be paid for by a local sponsor, so the first run will be very small. Hopefully we’ll get enough interest in it that we can do a larger run down the line! I work at the gibbon conservtion center in santa clarita and I am interseted in having some of your comic books to sell to raise awareness with the kids that come visit. Please let me know how I would be able to get a copy. Thank you!